Brussels lockdown: Transit, schools, stores closed over "imminent" attack threat. 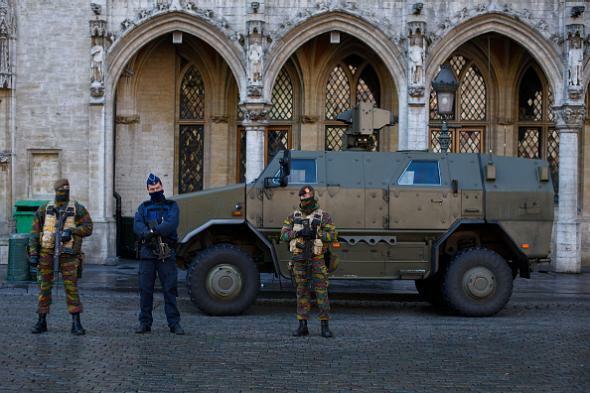 An armed policeman and two soldiers in Brussels on Nov. 23, 2015. Soldiers and heavily armed police are out in force on the streets, and people have been warned to avoid large gatherings. “I’ve never, ever seen Brussels this quiet,” one resident told the New York Times; “we’ve never seen anything like it,” said another. Several of the men believed to have planned and carried out the Nov. 13 Paris attacks lived in the Brussels neighborhood of Molenbeek. One of them, a 26-year-old Belgian-born French national named Salah Abdeslam, was stopped and released near the France-Belgium border the morning after the attacks by officers who did not realize his significance. Abdeslam is still at large.